Review: The Testament / It's Just Movies Review: "The Testament"
Yoel Halberstam has seven days to find a mass grave in Austria before construction starts. But where exactly is it, why won’t people talk and does it actually exist? Halberstam is an historian, an orthodox Jew, and a devout seeker of the truth. His crucial work is hindered by Holocaust deniers, the practical Austrian Ministry of the Interior and people afraid to testify because of potential reprisals. In his research, he is soon confronted with more than the truth about the mass executions – the shattering truth about his own birth. 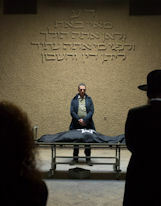 “The Testament” won the Haifa International Film Festival Best Film Award. It is loosely based on a true story, though the thoughtful ending is original. 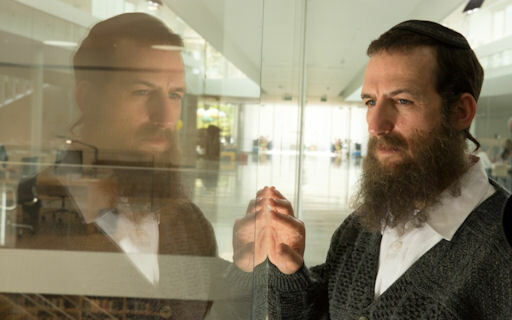 Ori Pfeffer, as Yoel Halberstam, is an acting genius and Amichai Greenberg, the insightful writer/director, brings out exceptional performances by all involved in a culminating drama of integrity. Greenberg’s story plays out on several parallel planes. First is the obvious search for the mass grave, second is the fear testifiers have in reprisals, and third is Halberstam’s own discovery that his mother took on a different identity in the war years. The missing mass grave soon becomes a symbol for cover-ups and tragedy. But the most important plane is the fourth that propels the suspense. This personal, yet also universal plane is where truth has an absolute value and deciding role to play. How Greenberg orchestrates Halberstam’s burning struggle takes this film into the realm of stunning masterpiece. He cannot escape who he. Like his society and us, he is an amalgam of significant contradictions with which he must come to terms. The key that he finds is within all of us and that which enables us to rise. “The Testament,” a remarkably reflective masterpiece, is being shown at many Jewish Film Festivals showing throughout the United States. It screened in Portland, Oregon, at the Northwest Film Center on June 22 and 23 and is scheduled for July 11 at the Sid Jacobson Jewish Community Center in East Hills, New York and July 15 at the Axelrod Performing Arts Center in Deal Park, New Jersey.